The Alpine iLX-F309 wants to impress with its floating halo style design and integrated smartphone tech. The Alpine iLX-F309 wants to impress with its floating halo style design and integrated smartphone tech. 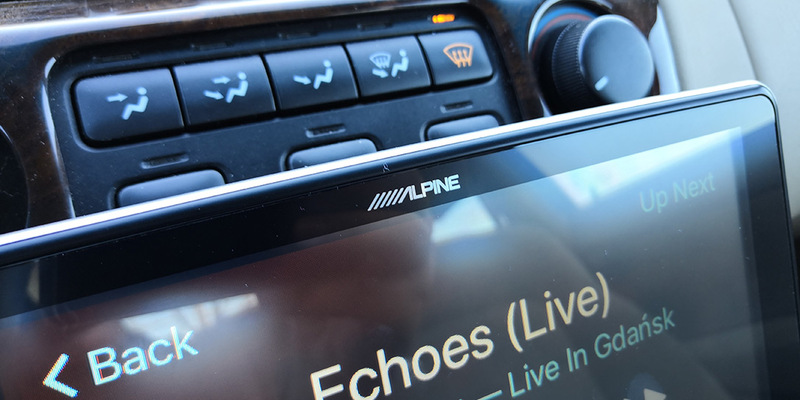 Alpine makes some excellent car stereo head units and we absolutely loved the Alpine iLX-107! Will the Alpine iLX-F309 leave the same impression? Find out in our full review of the Alpine iLX-F309 below! Before we continue, it is recommended that you have your Alpine iLX-F309 installed by a professional. You could install this on your own, but we did not. Alpine had ours professionally installed by Soundz Plus in Warrenville, IL. You could get this installed by Best Buy and other big-box locations, but I’d recommend finding a shop like Soundz Plus. Check online reviews when locating a shop as using a professional whose business is built around car stereos usually means they’ll do a far better install job. Shops like Soundz Plus go the extra mile by soldering wires not just capping them like cheap shops. Plus, getting a reputable install goes a long way should you ever need to use your warranty! The guys at Soundz Plus were excellent and the install took about an hour. Nice build and quality materials. The Alpine iLX-F309 design has a slick tablet-like feel but with a matte display. It’s 9″ WVGA screen looks massive in my Honda Accord Coupe. I’m sure the smaller the dashboard area, the bigger this thing is going to look. The materials used are all high-quality and the unit does not feel cheaply made at all. It sort of looks like an Android tablet floating in front of the dashboard. I did find the bezels around the unit to be large, it would have been nice to see these bezels a little bit slimmer. Once you have the Alpine iLX-F309 installed the only things you’ll notice are the screen and the bottom row of “buttons.” These look like physical buttons but they’re capacitive buttons. Alpine did a really nice job of making these look physical and part of me really wishes they were. While I really love the idea of a touchscreen, having a physical and tactile button for volume and other functions are still something many users prefer. That’s not to say these capacitive buttons are bad. You have the volume up and down as well as the mute button, your Siri/Google Assistant button, menu, favorites, and track back and forth buttons. The screen did obscure some of my heating and AC controls. One thing you’ll need to consider is the potential of the Alpine iLX-F309 of blocking or obscuring some knobs and switches in your car. My review unit was installed as far down as it could go and the radio obscured some of my heating and AC controls. The F309 is adjustable so you can tilt it to find the best spot but for my particular car, it just didn’t tilt down enough. It wasn’t horribly bad but it’s something to think about when considering this stereo. When I first saw this stereo at CES 2018 I was really impressed with the floating halo style idea. Now, having used it in real life, the halo idea is still great but does come with its challenges. I found the stereo shook and vibrated a lot because it does float like it does. It’s not super bad but for someone with OCD about certain things, I noticed it. Again, something to consider while thinking about purchasing this unit. 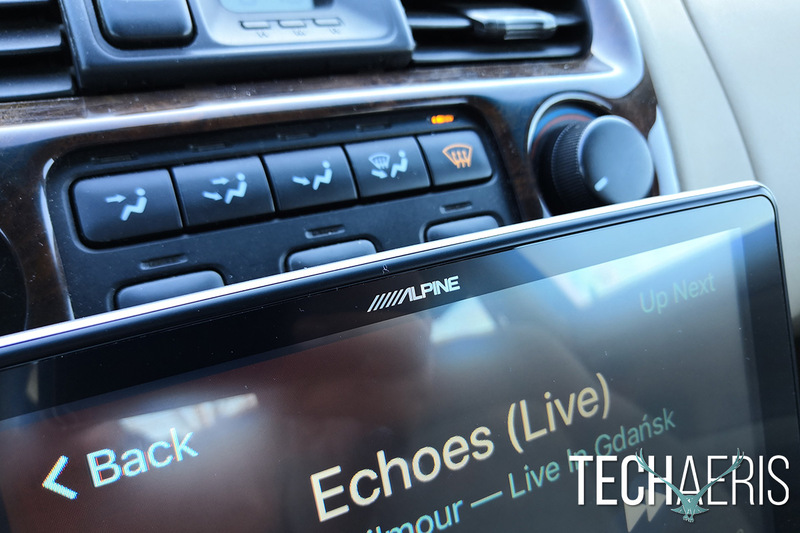 The screen is nice, typical of today’s car touchscreens but the viewing angles weren’t as good as the last Alpine radio we reviewed. Overall, this is a nicely designed unit. The viewing angles are just okay, it does shake a bit when driving but the advantage here is, it fits in a lot of different cars. The sound portion of this review is assuming you’ve only replaced your head unit. The Alpine iLX-F309 was installed in my stock Accord Coupe with stock speakers and stock amp. Your sound experience can be significantly enhanced by upgrading both your amp and speakers. That being said, having already reviewed the Alpine iLX-107, I knew replacing the stock stereo would be a great improvement to the stock speakers. The F309 really pushed much better sound through the stock Honda amp and speakers. My Accord stereo really struggles to give me any sort of significant volume and the F309 fixed that fast. Setting the F309 at 40% volume was like having the stock stereo at 100%. Alpine includes a built-in EQ, which you can also download as an app, that allows granular control of your sound. You can tweak frequencies as well as balance, fade, and even spatial dynamics. The Alpine iLX-F309 can without a doubt improve upon the sound of most stock stereos. Overall, this unit will enhance your car stereo experience and can most likely perform even better with the addition of a good amp and speakers. The Alpine iLX-F309 is super easy to use. Of course, if you’re planning on self-installing this, ease of use may be more difficult. I’ll say it again, it is well worth finding a good stereo shop that will install this properly. That being said, after installation all that’s left is setting up your Bluetooth and programming radio stations and other basic functions. The Alpine menu system is pretty straightforward and there’s really nothing to it. Overall, this radio is easy to operate. No wireless CarPlay or Android Auto. If you’re okay with wired then you’ll love it. The Alpine iLX-107 had one minor flaw and that was the absence of wireless Android Auto. 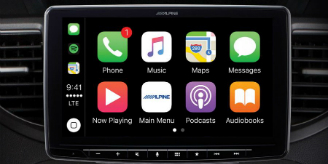 I am pleased to say that both Android Auto and Apple CarPlay are found on the Alpine iLX-F309. But I am disappointed that these are wired only options. While at CES 2018, I must have missed the fact that there was no wireless for Android Auto or Apple CarPlay. Wireless is what makes the iLX-107 great and useful. While you get all the functions of both systems on the iLX-F309 you need to use the included USB port to access them. To me, that is an extra step I just didn’t want to have to do. Still, having either Apple CarPlay or Android Auto is a huge benefit. You still get your phone calls, texts, maps, streaming services and more using the wired option. 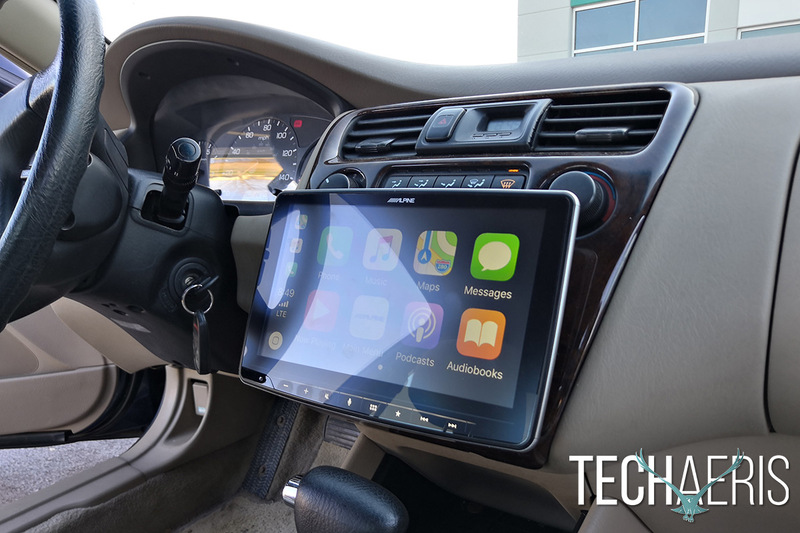 I used the F309 with CarPlay and it was just as good and useful with the 107. One of the great things about both of these systems on this particular unit is the size of the screen. The massive 9″ screen really gives you a lot of real estate to see things you need to see. 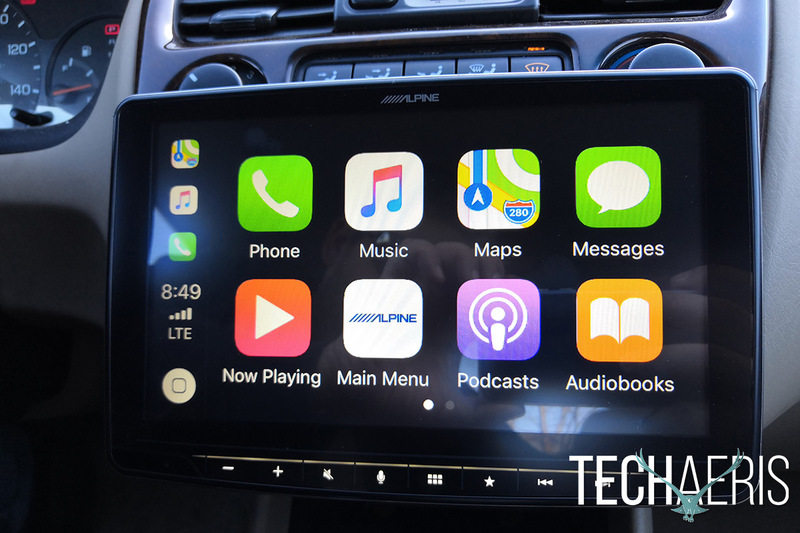 Everything was smooth in CarPlay including scrolling, voice commands, apps and phone/text functions. Overall, the Android Auto and CarPlay experience is good on the F309 but could be significantly enhanced by making it wireless. As far as the radio portion, streaming music and basic functions of the Alpine iLX-F309, those all performed very well. A few other features this stereo has is the ability to add safety cameras and accessory control to the system. The installers at Soundz Plus told me they’ve already installed a few of these units in trucks with winches, snow plows, and other powered accessories. 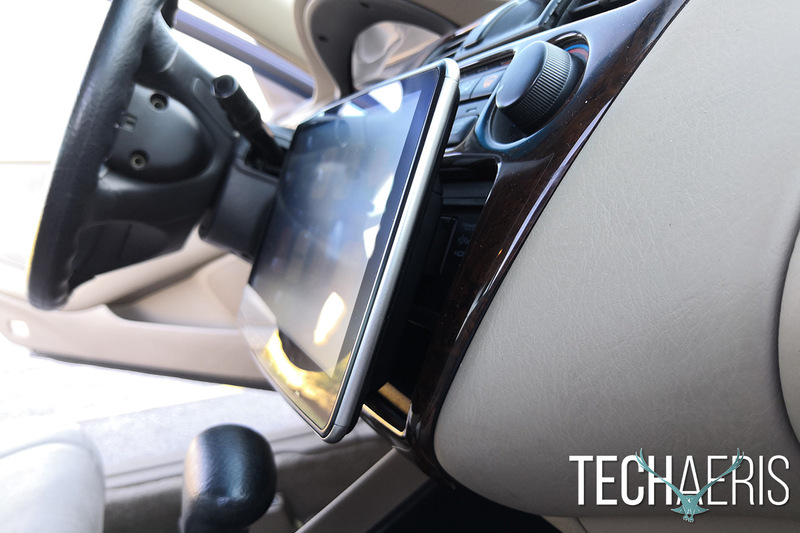 The Alpine iLX-F309 can be connected to these accessories and you can control them from the touchscreen. Once you have everything connected your screen will have the controls for your chosen accessory on screen. That is pretty impressive. 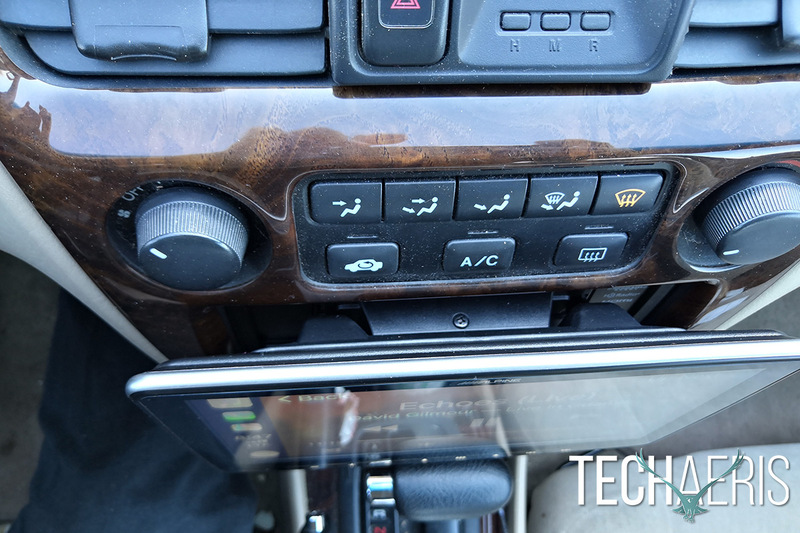 I have no accessories for my Honda Accord so I wasn’t able to test this but the guys at Soundz Plus assured me it was a very well received feature by their customers. Overall, the performance of this unit is really great. It can do a lot more than a regular car stereo and that could prove very valuable to a certain market. The cars vibrations can be transferred to the unit causing it to shake. The Alpine iLX-F309 is priced at $899.95 USD. Value for money is a hard one for me this time. For my personal use, I felt that this unit should have had wireless Android Auto and CarPlay, but it doesn’t, but it does some other cool stuff with cameras and accessories. That could be a very good value to a lot of people who aren’t worried about the missing features I wish it had. If you’re looking for wireless Android Auto or CarPlay, this doesn’t have it. If you have bad OCD and can’t stand a screen vibrating then you may not like this. Otherwise, the Alpine iLX-F309 enhances your stock stereo and offers up a great user experience in its software. It also adds value with the ability to control accessories and cameras from your dashboard. 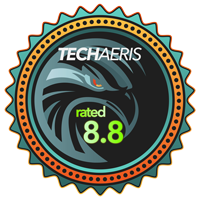 We received a review unit of the Alpine iLX F309 for the purposes of this review.